That's interesting John. Thanks for taking the time and effort to document this behavior. Can you try your test after turning the car off, then exiting the car leaving the fob inside and the doors unlocked? That would be close to ausdland's scenario (except, of course, he has an '18, which may make a big difference). Don't know about phantom loads but we JUST replaced the ORIGINAL battery in our 8 1/2 year old '11 Outback with 109,000 miles on it. That's normal battery life in Maine. In Phoenix or Vegas, that would be a miracle unless the car was garaged in an air conditioned space. Without a helper this morning, I did a similar but not exact test of @ausdland scenario of leaving key fob in an unlocked car. I couldn't both monitor the current usage from the engine bay and get in and out of the driver's door / seat by myself. What I did do was get in the car, turn the ignition to the On key position, roll down the driver's window, turn off, and then exit the car closing the door. Reach in through the window and place key fob on center console armrest. Reach in and turn ignition switch to On position. Reach in and turn ignition switch to Off position. Start Timer and Monitor current draw from the battery. LOL, you don't have to deal with -20 degree nights. 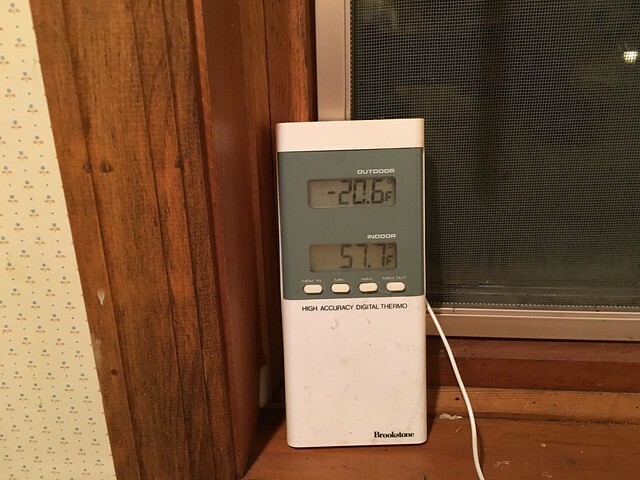 We haven't seen a HIGH of 60 since October 22nd, nor 55 since November 8th. 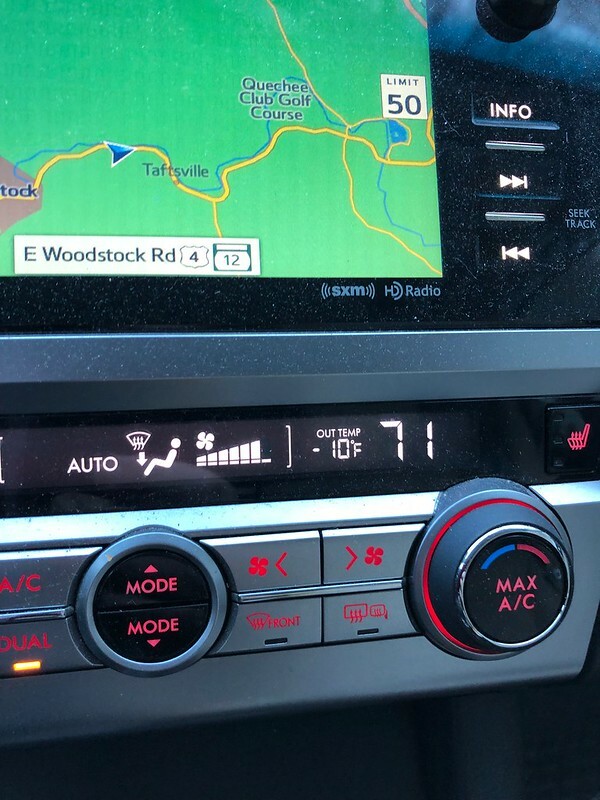 Cold weather is also a challenge for starting cars. I have done some measurements myself on the Outback as well as on a Mercedes. One challenge, is how to measure those small currents accurately. What type of meter are you using? And where do you attach it? I knew someone would ask sooner or later. I am using a clamp-on AC/DC ammeter. The model is Intertek 5009374 / Voltcraft VC330. There are quite a few similar clones available all basically made by the same company. They usually differ only in the case color and are priced around $45 or so. I am using it clamped around the negative return lead(s) at the battery. When measuring DC currents, you have to be careful to calibrate it first. To calibrate the meter, position it very close to (but clamped around) the wire you are going to measure. You should also try to hold it in the same orientation it will be used. At that point, you zero the reading and then clamp it around the wire. If you are not careful about proximity and orientation when you zero the meter, it will not measure accurately because the earth's magnetic field will affect readings. 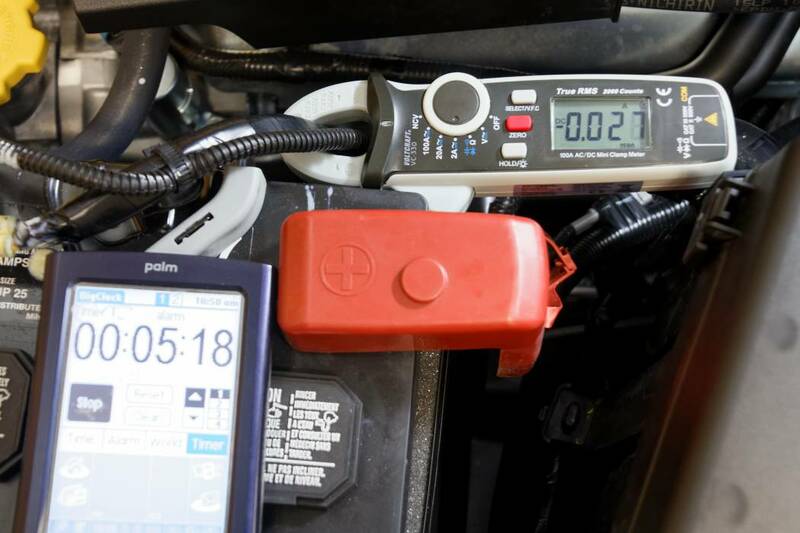 My meter also drifts away from calibration for the first 5 minutes of use, so I always turn it on and place on the engine cover until I am ready to take readings. For currents below 2 Amps, I use the low scale which reads to mAmp values. For most of my measurements, I use the intermediate 20 Amp current range which reads to two decimal digits. The photo below shows it clamped around the battery return wires. Also seen is the (2003 vintage) Palm organizer I use for making timings. -20F isn't going to impair battery life. Hot kills batteries, not cold. I see cold weather, too. My batteries tend to last 7 or 8 years. I am using it clamped around the negative return lead(s) at the battery. John, I asked because I have been through this in past on my Mercedes - looking for causes of stray currents. I have a different but similar clamp on meter and know I should have bought a Fluke or similar! On the Outback, it is hard to attach the clamp meter properly because there are two conductors at least, on positive and negative terminals. Meter should only go around one conductor (not two) and that conductor should be centered and at 90deg to meter opening (I think I tested both pos and neg one at a time and added measurements) Polarity should also be correct, but which side is positive on a battery ground cable?? Maybe meter should be other way around? The accuracy of these meters at very low currents is usually not very good. The manual for the model you have says (+/- 2% of reading +8). where Specified accuracy is ± (% of the reading + display errors in counts = number of least significant digits). What the heck does that mean?? OK, I checke with Fluke - see at bottom of post. All my test on my Subaru told me, was that current with everything off and no FOB nearby was something under 100mA and with FOB nearby about 2 amps. Someone said leakage current should be about 70mA. Thats just the way it was designed, so nothing I can do about it except attach battery maintainer when car is not used for long period. And keep FOB well away from car when it is parked. ccuracy for a clamp meter is usually expressed as a percent of reading. An accuracy of 1% of reading means that for a displayed reading of 100 amps, the actual value of the current could be anywhere between 99.0 and 101.0 amps. So for +/-(2%+8) for 100mA, would that then be between 97.2 and 102.8 mA?. Good enough for our purposes! Yes, there are limitations for such inexpensive meters but we are not doing Standards Compliance Testing using meters such as these. I did a quick and dirty one time test of the meter when I got it by putting a 120 Ohm resistor across my 12 volt bench power supply. I don't recall the exact reading but it was within the +/- 2% specification; I marked it a "success". It was good as those I used to use in my lab work before retirement that we marked "For Indicator Use Only" -- in other words, it won't cut it for critical specification testing but is more than good enough to use for debug and troubleshooting. Regarding the double conductors; that warning doesn't apply when the conductors are of the same polarity and clamped in the same bundle. The meter will read the sum of all currents flowing in the individual conductors. Otherwise, you would not be able to measure DC currents in stranded wire cables since there are as many as 20+ conductors in such wire depending on gauge. The warning you see about single wire measurements applies to wire bundles where there is both a power and a ground wire present. The orientation also doesn't matter as you still get a valid reading. You don't need to turn the meter around. Just ignore any sign in the result since +10 mAmps is the same as -10 mAmps in our usage when measuring the current returning in the ground wires to the battery. Routing the wire significantly off the 90° entry and exit will affect the reading but it is still accurate enough for our purposes here. One other thing to note is that I read somewhere that the Outback is not specified as having 70 mAmps parasitic draw. That is instead the criteria the repair shops use for evaluation of whether further diagnosis is required or not. The test I saw said anything over 70 mAmps dark draw in a test must be further investigated. The actual nominal usage is going to be well under that as in the case for my car. They likely expect parasitic draw to vary car to car by as much as maybe 30% and set a threshold well above that as the diagnostic value -- in this case I think they set it around 2x+. John, I should have said bundles instead of conductors. Your picture shows two bundles passing through the clamps. When I did it, I separated the bundles and held the meter at 90deg with wire bundle as centred as I could get it. Did that on Pos and Neg sides. Not that it mattered much, because my meter just doesn't have the accuracy needed. But good enough to show that there is no major drain when everything is off. It did however show me how large a drain there is when the FOB is near. That is what killed my battery back in December.